← Rock Climbing in Croatia – Where to Go? 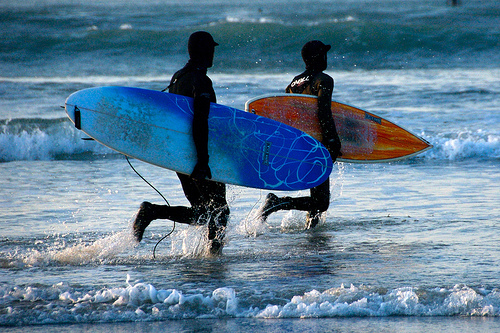 Surfing is not just a sport that is followed in the States and Australia, Britain has some great surfing beaches, and some of the best of them are in Cornwall and Devon. The water may not be as warm, or the bikinis quite as skimpy, but the waves are just as exhilarating, especially during the winter months as the currents sweep in from the Atlantic. Make sure to pack a thermos and some blankets for when you decide to tackle the water during the winter months, and your sunscreen and drinking water for your summer visits to these incredible beaches. The scenery at Sennen Cove is amazing; the water is cool and clear and there is a constant swell here. This is a beach suitable for all levels of skill. 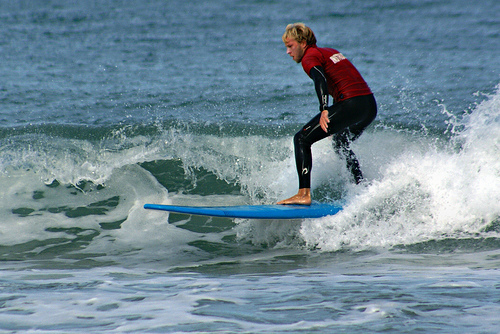 The surf center here offers group as well as individual lessons and provides all of the necessary equipment. St Michaels Mount is close by with its fabulous castle, harbor and tropical gardens, and if you feel like walking, Land’s End is just half an hour away. Sloaney tones and a strong beach break make for good surfing here. This is a favorite beach of Olympic gold medalist James Cracknell; in fact the rower loves the area here that much he named his son in honor of the place. Surfing lessons are available at the local surf school and if you want to check out the local area you can follow Tarka’s trail through North Devon, as this is where Henry Williamson wrote Tarka the Otter back in 1921. Porthleven is probably the most challenging of all of the surfing beaches along the south west coast and surfers need to be experienced to ride the waves here. It is known to have the most incredible right hand break of all of the beaches in the UK which makes for perfect tubes on clean days. Rocks can be found just below the surface at Porthleven, especially at low water which is why experience is necessary on this beach popular with extreme surfers. In contrast to Porthleven this beach offers a safe and sheltered experience. Lusty Glaze beach is in Newquay and is edged by 200ft cliffs. This is however a private beach which is owned and operated by the Adventure Centre. It is a place loved by those looking for the adrenalin surge with many people choosing to surf, take lifeguard courses and indulge in outdoor pursuits on the rock faces. Surfers should look out for the odd barrel when riding here. The surf in Bantham is much more consistent during the winter months than the summer. Bantham has been popular with surfers for over 30 years; waves are breaking here no matter what the tidal stage. Surfers should be aware of the occasionally strong rip currents that can catch you off guard if you’re not careful. Most of the Devon coast is popular with surfers as it seems where there is coastal water, there is a wave that can be ridden. If you’re planning on visiting Devon and Cornwall, make sure your accommodation is as cool as the surf. Check out the Owner’s Direct website and book one of the many Devon cottages or Cornwall cottages before you travel. This entry was posted in Europe, Surfing, Travel, Water Sports and tagged Cornwall, Devon, England, Surfing, UK. Bookmark the permalink.